On Tuesday, JetBlue announced new, stricter guidelines for customers flying with emotional support animals. 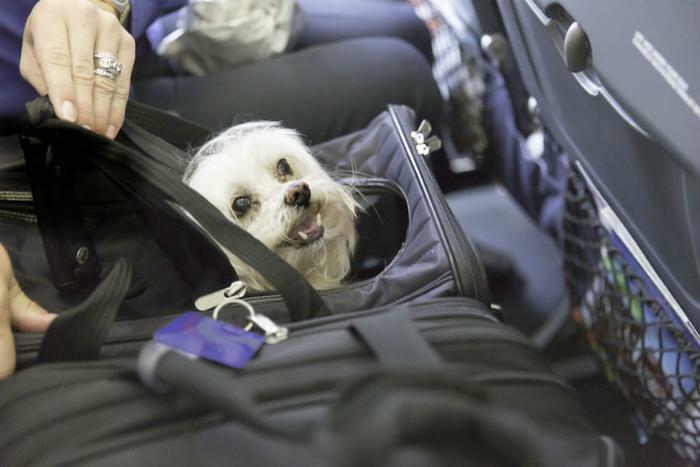 Effective July 1, the airline is requiring passengers to submit advanced notice (at least 48 hours before a flight) and documentation when traveling with an emotional support or psychiatric service animal. JetBlue’s policy for other non-psychiatric service dogs, which are trained to perform specific tasks for passengers with disabilities, remains unchanged. Recently, other airlines have been tightening up their policies, as the number of passengers traveling with emotional support animals has spiked. It’s important to note that emotional or psychiatric support animals don’t have to be crated for the flight and can come onboard free of charge. According to JetBlue’s official statement, the primary motive behind changing the policy was customers’ safety. “The new requirements follow a dramatic increase in industry incidents involving emotional support animals that haven’t been adequately trained to behave in a busy airport or the confined space of an aircraft, which creates health and safety risks for customers, crewmembers, and other service or support animals,” the statement said. “As always, we welcome the opportunity to support customers who require special assistance or accommodation while ensuring a safe environment for everyone on board,” added JetBlue VP of Safety John Allen. According to JetBlue’s website, the airline classifies an emotional support animal as an animal that “provides comfort to support a customer’s diagnosed mental or emotional disorder.” On the other hand, service animals are those that have been trained to perform specific tasks to assist the customer while traveling. The company restricts passengers to one emotional support animal per customer and three service animals per customer, with only dogs, cats, and miniature horses being allowed onboard. JetBlue has had hedgehogs, ferrets, rodents, snakes, spiders, reptiles, and animals with tusks banned for many years now. A confirmation of animal behavior form: this document must be signed by the customer and confirms that the emotional/psychiatric support animal is trained to behave properly both in the airport and onboard the aircraft. Additionally, the owner of the animal must accept liability for any injuries/damages to property. According to a JetBlue spokesperson, the previous policy only required one form for the passenger’s mental health requirements. Customers must submit these forms to JetBlue at least 48 hours in advance of their flight. The forms can be downloaded, completed, and submitted to JetBlue online. Additionally, the paperwork must be present at the time of the flight, as it will be subject to review by JetBlue personnel prior to boarding. This change to JetBlue’s policy comes after an increasing number of reports were filed about attacks to both passengers and other service animals on planes. Delta tightened up its rules earlier this year after conducting a study on animal incidents on airlines. The findings show that animal incidents on planes have increased 84 percent since 2016. United and American Airlines have updated their policies to reflect these incidents as well. How much should you get for giving up your airline seat?